West Vancouver sees beautiful, sunny days throughout summer but during winter, it can see some doozies. Residents cannot always be prepared for unexpected weather and snowfall but our Gorillas are always ready. Our West Vancouver snow removal and salting service keeps your property free and clear of that pesky snow. West Vancouver Snow Removal & Salting: Why Bother With Professionals? Heavy snow cover is a huge attraction up North, coating slopes and drawing crowds. In such areas as West Vancouver, however, snow fall is a little lighter. When temperatures take a dip, residents should start thinking about their next step. Snow might be fun for a while, but it becomes a pain rather quickly! 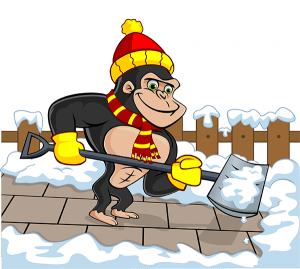 Instead of contending with snow as it happens, our Gorillas plan ahead. By monitoring incoming cold fronts, moisture levels and temperature, our Gorillas can keep ahead of those storms. Gorilla Property Services has technicians on call 24 hours a day, 7 days a week in order to best serve the West Vancouver area. Having timely local is service is key to keeping your home or business running smoothly. That is why we offer automatic snow removal services for snow fall of 3 inches or more. Throwing down salt once throughout the season is not enough to keep your property safe and passable. In a climate like West Vancouver’s, temperatures are constantly changing. You might be facing off against a frigid day, followed by sun, followed by cold. During this time, snow thaws and re-freezes creating icy patches along roads, sidewalks and driveways. When it comes to your home, you want guests to come and go freely without a tumble. For businesses, the stakes are even higher! One nasty fall can mean a whole lot of trouble for you and your customers. Don’t wait until an accident happens! Knowing where and when to salt is a learned skill and that is why our Gorillas are vigilant. We are always learning how to service properties on an individual level, hitting all those problem areas your space might have.